It’s that time of year when holiday activities, social commitments and family gatherings make it difficult to keep a sane and manageable schedule. It’s so easy to scrap the hour of Pilates for a luncheon gift exchange or shopping spree. Wait a minute! Where do you get some very real and lasting benefits? Practicing Pilates. Those benefits extend far beyond the hour spent on the apparatus or the mat. The exercise system was created by German-born Joseph H. Pilates a century ago. As a prisoner of war, he developed a discipline to combine the physical training of the ancient Greeks with the meditative strength of the East. He called it “contrology,” because it required concentration, a strong abdomen plus deep stretching with a focus on breathing. Pilates develops improved body mechanics, enhances balance, strength, coordination and flexibility, qualities we all need to function well each and every day. Pilates focuses on developing, enhancing and maintaining core strength. Your core is the center of your torso and the muscles that wrap around and support your body, front and back. Pilates also develops spinal flexibility. During the holiday season, there are increased demands on the body and on the mind. Like it or not, there are more social activities, additional shopping trips, entertaining, cooking, cleaning … the list goes on. Let’s face it, the holidays can be exhausting. Remember that Pilates demands mental focus, creating a strong mind/body connection. Pilates students know they must focus on breath as their mind directs their body to flow from one pose to another. Pilates is not easy, nor can it be practiced without focus. A personal trainer can instruct, motivate and encourage, but students themselves must bring the focus and intention. Pilates benefits emotional health. The smooth, steady movements quiet the mind and soothe the nervous system. It’s the perfect prescription for a sane holiday season, so maintain your practice instead of postponing it. As you lengthen and strengthen muscles, you’ll improve your circulation and whisk tension away. Each workout will leave you feeling calm, balanced, and rejuvenated, and who doesn’t need that, and even more so during the holiday season? A skilled personal trainer can customize your Pilates session so that you’ll be physically challenged, but able to let go of the tension seems to go hand in hand with the holiday season. For people who haven’t experienced a Pilates session, the holidays are a great time to start. Why not give yourself the gift of fitness? Pilates does not stress your joints, but its exercises condition your muscles and your mind. That’s right. Pilates requires focus in order to properly execute the movements. Focusing on your body and tuning out the distractions life offers increases self awareness. Since Pilates is gentle, it can be practiced every day. In fact, like anything else, in order to see results, it takes consistent and regular practice. Your personal Pilates instructor will guide you in the practice, making sure that you are executing the appropriate exercise safely and correctly. also leads to subtle posture improvements, which will also eliminate tension, driving away headaches, backaches, neck aches, and other aches and pains. Your core will become flexible, and you will become more balanced, both mentally and physically. Take care of yourself so you can care for others. Handle seasonal stresses with a smile, and keep those Pilates sessions on your calendar. Nancy Hawkins Rigg is the founder and owner of Forever Fit Foundation, a personal training business specializing in Pilates, Gyrotonic, Gyrokinesis, Yamuna Body Rolling and sport specific training. 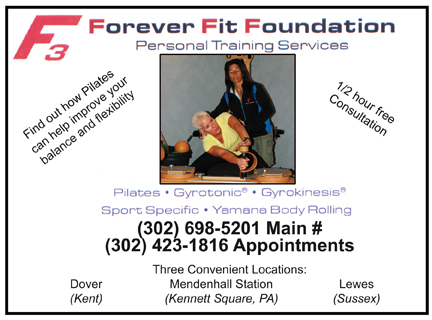 Forever Fit Foundation accepts clients at three sites: Dover and Lewes, Del., and Mendenhall Station, Pa., just over the Delaware line. A certified athletic trainer, she earned her bachelors degree from the University of Delaware and her master’s degree in exercise science and sports medicine from Miami University in Ohio. Please call (302) 423-1816 or (302) 698-5201 to schedule an appointment for more information. Next Story → Can I? Yes I Can!